Anyone who has a connection with Bangor will surely agree that the old Elevator Building is truly a landmark in the community. It was not hard to see that the structure in 2004, was also in dire need of some TLC. An agreement was reached and plans were drawn up for a lease with an option to buy, between the DDA and a partnership consisting of Mike Fritz (representing Michigan Summer Blueberries, Inc.) and Bob Emmert. 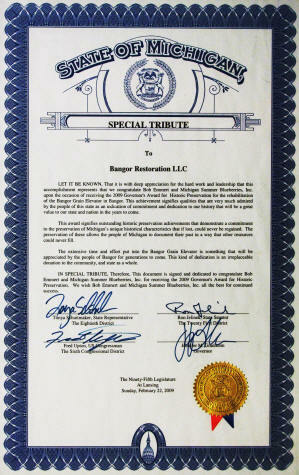 The partnership was known as Bangor Restoration, LLC. To say that this event rivaled the coming of the railroad in the early 1870�s is probably an overstatement. However, the restoration to the Bangor Elevator is a welcome and enlightening improvement to the downtown business district. The building has now been restored. In December of 2008, the Bangor Elevator was granted the prestigious status of being placed on the National Register of Historic Places by the United States Department of the Interior. 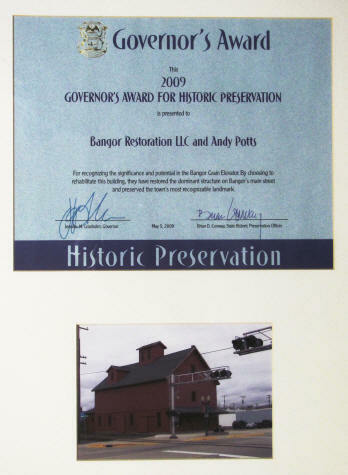 In 2009, Bangor Restoration was presented a Governor's Award for Historic Preservation. It was one of seven projects in the entire state of Michigan. 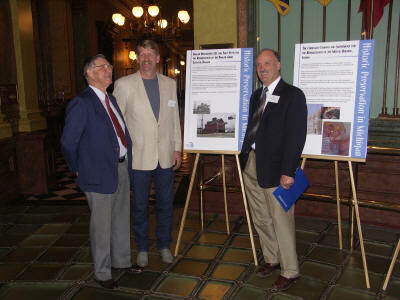 The 95th Legislature of the State of Michigan presented a Special Tribute in February of 2009 to Bangor Restoration for its accomplishments in the preservation of an historic building. This Tribute was signed by State Rep. of the 8th District, Tonya Schuitmaker; State Sen. of the 21st District, Ron Jelinek; U.S. Congressman of the 6th Congressional District, Fred Upton; and Governor of the State of Michigan, Jennifer Granholm. The Bangor Elevator is now transformed into a micr-brewery. It is also rented out as a reception hall and community gathering spot during holidays. There is a full catering kitchen and enough tables and chairs to seat a capacity of 130 people.